This is one of the hardest posts I've ever written. I'm dedicating this drink, which I made using the Cocktail Dice from Leafcutter Designs, to my dear friend and fellow 37 Cook member, Christy Hughes, who recently, suddenly, and totally unexpectedly passed away. 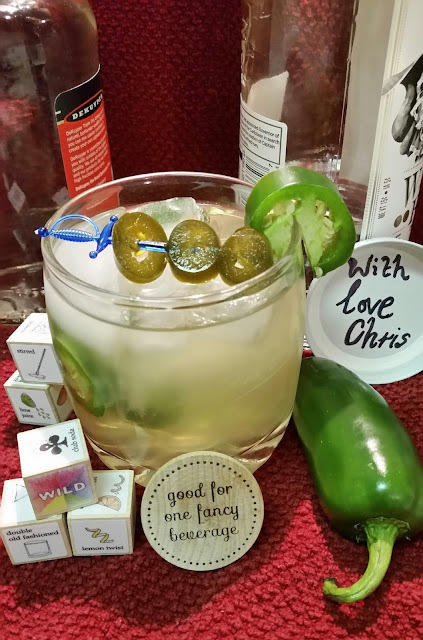 Christy was from Texas and she loved jalapeno peppers, so I knew I had to incorporate a jalapeno in my recipe as a nod to her. Also, I think everyone that knows me expects something a little spicy in most of my recipes! I had tears running down my face as I was assembling the drink but, as Christy would expect, I held the drink up and toasted her. I love you, Christy. Now, back to the dice challenge. The cocktail dice were a lot of fun, rollin', rollin' and rollin', trying to come up with different drinks. My oldest daughter is a bartender and she said if The Bus Stop came out good, she was gonna use it as a drink special in the restaurant where she works! Why call the drink The Bus Stop you ask? We have a really fun group on Facebook called Serious Eats Water Cooler. We travel all over the world in our imaginary bus to visit each other, cook, eat and drink and I think Christy would laugh at the name! If you make this drink, make a toast to my friend for me. Thanks. In a tall glass, muddle the sugar, 3 or 4 slices of fresh jalapeno pepper and 1 ounce of triple sec. Strain into a rocks glass, add three or four slices of fresh jalapeno according to how spicy you want your drink. Mine wasn't real spicy. Add the rum, ice, and a splash or 2 of ginger ale. I garnished mine with some sweet pickled jalapeno peppers that my dear friend, Brooke, sent to me. They're spicy, sweet, vinegary and really topped off this drink well! Matt's daughter, Tanya and her boss. They featured The Bus Stop at their bar in Idaho. It was a huge success!